Bristlecone Pine is a small to medium evergreen with an irregular habit and contorted branches. This extremely long-lived tree is relatively low maintenance and drought-tolerant. 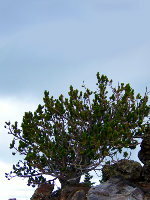 It is known for its deep green to blue-green needles flecked with white resin, and its thin, scaly, grey-brown bark. Because it is extremely slow-growing, Bristlecone Pine is well suited to smaller properties.